Two different conditions exist which both can cause damages to property and structures, subsidence and sinkholes. Subsidence generally occurs over a wide area with a gradual depressing of the ground surface. One of the most famous examples of differential subsidence is the Leaning Tower of Piza. Sinkholes occur from unconsolidated overburden collapsing into a subsurface void. Subsidence is generally slow and occurs over a long time span while sinkholes appear more rapidly, even suddenly at times. Of the two conditions, sinkholes are considered more dangerous and damaging which is why this article will focus on them. The dissolution of rock in water is the most common cause of sinkhole formation. Two basic classes of rocks are soluble in water, Evaporite (mainly salt, gypsum and anhydrite) and Carbonate (dolomite and limestone). Evaporite rock formations are less prone to sinkhole formation in the Northeast as most of this rock occurs much deeper than the carbonate formations. Irrespective of which rock type is more likely to cause problems, several known areas of carbonate and evaporite soil geology exist in Pennsylvania and New Jersey. While dissolution of, or voids in, these rock formations are the most common causes for a sinkhole event there are other possibilities. Mining, fluid withdrawal (wells, drought, oil & gas production), flooding, expansive clays and buried organics can also cause sinkholes. Sinkholes can be placed into three main categories; solution sinkholes, cover subsidence sinkholes and cover collapse sinkholes. Solution sinkholes occur where very little overburden exists above the rock and the rock surface slowly erodes forming a depression which gathers water and accelerates the dissolution. Cover subsidence sinkholes are formed where the cover material is permeable and probably sandy. Similar to solution sinkholes, these sinkholes occur gradually over long periods of time and appear as a gradual depression of the ground surface. Cover collapse sinkholes generally occur where the overburden provides some limited stability, usually in clay soils, where limited surface drainage exists. Over time, the rock dissolves in ground water leaving a significant void beneath the overburden which eventually collapses to partially fill the void. The collapse can be catastrophic, sudden and without notice. Clearly, cover collapse sinkholes are the most dangerous situation because they offer limited warning but all types impose significant hardships on property owners. As with most potential problems in life, planning and avoidance are the least expensive ways to limit exposure to damage from sinkholes. Planning can be done by anyone concerned with these issues. Some communities provide soil maps showing carbonate soil geology in their zoning ordinance. Review of available soil maps and zoning ordinances for these conditions is helpful to avoid areas with the most common cause of sinkhole formation. Web searches for news articles on reported sinkhole occurrences in a targeted area is another inexpensive tool to identify the potential sinkholes. More accurate tools for evaluating sinkhole potential are electro-magnetic conductivity, ground penetrating radar (GPR) studies and Standard Penetration Test (SPT) borings. These tools are generally used once potential sites are identified individually and are performed over a well-defined area. With these tools, engineers can completely understand the conditions for which they are designing. In potential problem areas, foundations for structures can be reinforced to span possible voids. 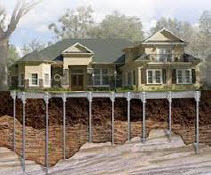 It is not uncommon to design foundations to span possible ten foot voids in some areas. A Sinkhole Exists, What now? With localized events, the damage from most sinkholes can be mitigated and structures stabilized. 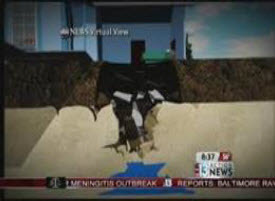 The sinkhole most likely happened because a void in the subsurface rock formation occurred. It is important to identify what caused the void first. Is mining activity, fluid removal, groundwater infiltration or a utility line break the issue? Are there any more voids in the area which need to be addressed in the remediation? This is where the GPR and SPT tools are indispensable. Once the limits of the active soils, voids, damage and potential damage are determined, remediation techniques can be analyzed for effectiveness. 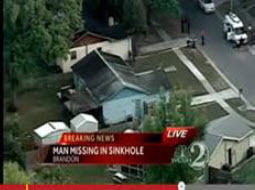 The most two common fixes for sinkholes are compaction grouting and underpinning. Engineers generally don't like compaction grouting because there is no method of analysis available. The contractor's experience is key in this type of remediation, where a concrete grout mix is pumped into the void to seal it from further raveling or dissolution and provide support for fill to be placed on top. In some shallow cases, compaction grouting can lift slabs (slab jacking) back into, or near to, their original positions. A newer type of grouting referred to as chemical grouting is becoming more common. 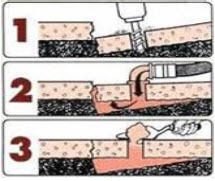 Chemical grouting is commonly used in loose or sandy soils to densify the soils by injecting polyurethane foam into the affected area. Some contractors are combining compaction and chemical grout with apparent success. Underpinning lends itself to empirical design and contractors generally provide warranties because of this. Typically more expensive than grouting, insurance companies are sometimes reluctant to allow this repair in claims cases. Many types of underpinning can be designed. Pre-construction, if the site condition defects are already identified, standard driven or drilled steel, wood, or concrete piles can be designed and installed. Decisions whether to also use grouting can then be made regarding potential cover collapse sinkhole prevention. Helical piles are turned in with a drill head mounted on a skid steer loader, wagon drill or excavator. They can be installed vertically or at an angle from outside or inside the structure. Micro piles are essentially threaded rods of various diameters and load capacities which are grouted into a drilled hole and fixed to the structure mechanically. Some investigation is possible by the layman. Search the web for sinkhole reports in your area and check with the local building officials regarding other problems they are aware of. If you still think something is wrong, it is probably time to engage an engineer to perform a professional study and make remedial recommendations. Sinkhole potential can and should be analyzed and remediated before catastrophic collapse occurs. The potential liability for damage to structures and life requires serious consideration. If you have any of the above mentioned indications of potential problems, Falcon Engineering is available for consultation.